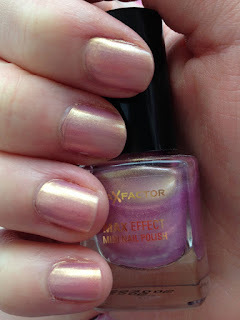 I've loved the Max Factor Mini Nail Polishes ever since they came out. They have a really wide range of colours, thin consistency and dry really quickly which is perfect. Although they're a bit pricey for the size I prefer then to bigger bottles as I rarely finish an entire bottle of nail polish before it goes gloopy. Sunny Pink is one of the more recent additions to my collection although i've only just tried it having had it for a few months. 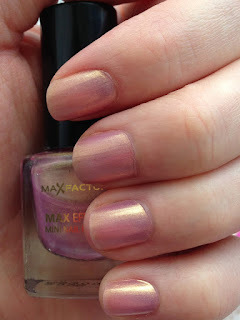 It's a lilacy pink with gold metallic undertones and is not really the kind of colour i'd normally buy. I was hoping this would be more of pink colour when applied but as you can see it looks a lot more gold when dry. I was really disappointed by this nail polish; the application was perfect but the colour is definitely not for me. I don't think it suits my skin tone and if anything it's made me realise how much I love more solid coloured nail polishes instead. I also tried it with the ELF Matte Finisher (right photo) which I preferred but I doubt i'll be using this polish much in the future. Got to admit the colour once applied looks alot different, can see what you mean about the skin tone. Still okay though, not as bad as some of the nail polishes I've got aha! Once applied it reminds me of the colour they put on mermaid actresses in movies ! Thanks for your lovely comments on my blog, mean alot!